April | 2013 | E-verything! I try to take a short walk around the block fairly early most mornings. Often this doesn’t happen because I need to work. However this morning I decided I needed a walk! I always carry binoculars on my morning walks because this is a good time for birds and I am doing my best to catalogue the bird species I see on the block. Usually I leave my camera behind because it is just another thing to carry and taking reasonable pics of wild birds (especially as most of them are small) is just not going to happen. This morning I really wished I had taken my camera! My walk took me up what we call “the pipe run”. This as the name suggests is a route where we have a pipe running from the bore about a hundred metres through the bush to the bore water tanks. The pipe is only about 5 metres into the edge of the bush from the firebreak on the northern edge of the block. As I walked beside the pipe I heard movement so I stopped and saw two of the recently released kangaroos slowly moving deeper into what is a fairly narrow wedge shaped strip of bush. I continued slowly and at the end of the pipe run I turned right onto the track between the bush and the top paddock. 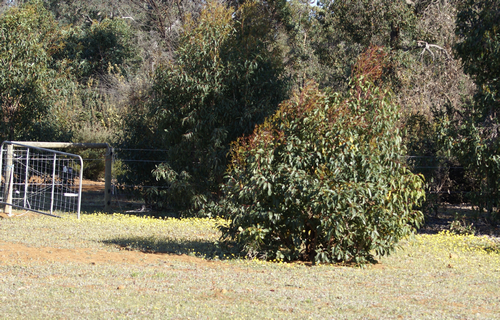 As I walked past the bush towards the paddock gate there were three kangaroos on my right in the edge of the bush. Two of them moved quietly away into the bush but to my great surprise the third one came towards me. I stood still and put out my hand, the kangaroo sniffed at my hand and seemed to decide I was “mostly harmless” and allowed me to stroke it. None of our regular visiting mob would come this close except at the one spot on the block (near to water) where they can sometimes find hay. So this is definitely one of the new release – and obviously one who hasn’t yet lost the “humans are friendly” response from being raised by people. 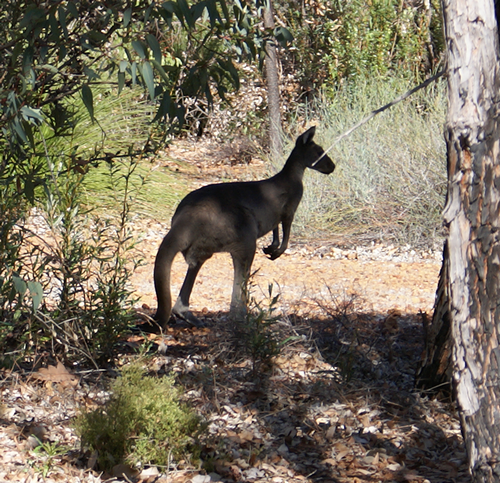 From about 15 metres before the paddock gate the ‘roo accompanied me on the rest of my walk – around 600 metres through the top paddock and back down to the house beside our other patch of bush. Luckily as I neared the water trough Phil was outside the house so I asked him to bring some green from the garden. The ‘roo ate some of this from my hand and then discovered some nearby food mix (we are still putting out a little transition food). This gave me the opportunity to go inside and pick up a camera so I was able to take some pictures of my companion. Although I didn’t discourage the ‘roo from keeping me company today I think I will have to do so in future. Kangaroos that hop calmly up to humans are at great risk to their lives as not everyone enjoys having them around. They are regarded by many farmers as a pest. Because of this we have made considerable (successful) efforts not to encourage our regular visitors to become too tame.The only place we are able to approach them is by the water supply we keep full for them. Anywhere else on the block they just disappear into the nearest cover. As I write this there are fourteen kangaroos outside my window. 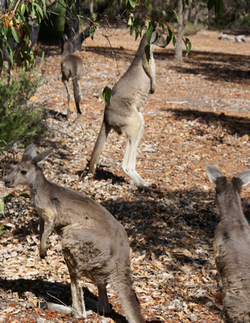 They are a mixture of some from our regular visitors (2 females with last year’s joeys still in attendance and this year’s young in the pouch) and the newly released group. There is a bit of occasional squabbling but not much. The two mature females are quite assertive about their personal space and also still protective of their joeys. 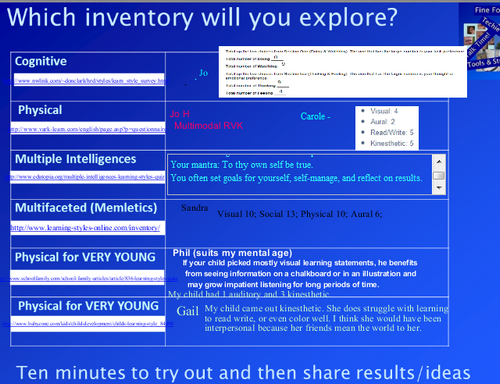 Also there seems to be still some “pecking order” being sorted out with the new group. So thus far it seems that our hope that the groups will mix and the new ones will eventually become part of the mob is more likely to happen than not! We now have quail added to our collection of edible and laying birds! 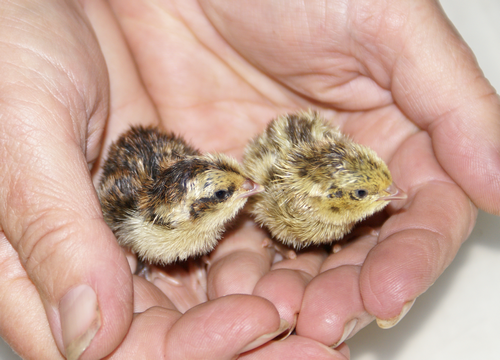 As well as four young quail from a colleague at work we were given a pair of adults by friends living nearby. The female of the adult pair was still laying although it is a little late in the year. Of course, as is our wont, we couldn’t resist trying to hatch some eggs! As usual we collected a week’s worth of eggs in our cooler at around 15 degrees C. This gave us 10 eggs – quail sometimes lay two in a day. At the end of the week we transferred the eggs to the incubator and left them to incubate for 15 days before taking them out of the rotator at the “pipping” stage – when they are ready to start making a hole in the shell. Nothing happened at 18 days when they should have hatched. “Ah well!” we thought, try again in the spring. However as we have had slow hatches before we left the eggs in the incubator for a bit longer (just in case). To our great surprise and delight we heard “meepings” from the incubator two days ago! We checked and found one chick well on the way to emerging and four more with small holes in the shells. 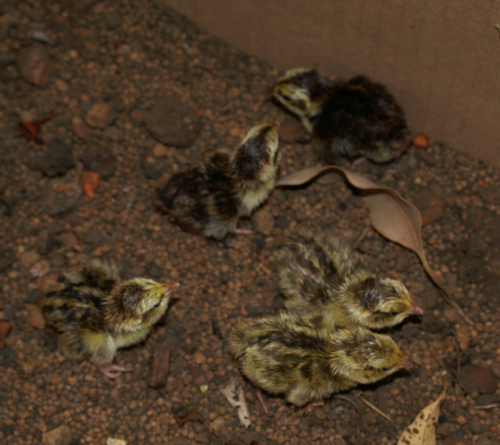 The next morning there were five tiny quail staggering around the incubator. Once they had dried off we transferred them to a brooder box with a lamp to keep them warm. They are so tiny that we are using a small jar lid for water as they either wouldn’t reach, or would risk drowning in anything bigger. Chicks and ducklings are of course very cute but these minute bundles of feathers definitely win top prize for cuteness! This morning we had another surprise – I was working peacefully away at my computer and heard a loud and indignant “meep” from the incubator. Investigation revealed another hatchling – this one must still be on daylight saving “grin”. We are hoping, ultimately, to be able to release quail into our vegetable garden – with a cage and nesting area that they can access but the chooks and ducks cannot. The released quail will then be part of our “pest control” system and will hopefully either breed themselves or lay eggs in their nesting area that we can collect and eat or incubate. We will of course eat any excess birds! More ‘roos outside our windows! Time for one of those posts about where I live rather than specifically education related. This morning we had an exciting visit from members of one of our local wildlife sanctuaries. 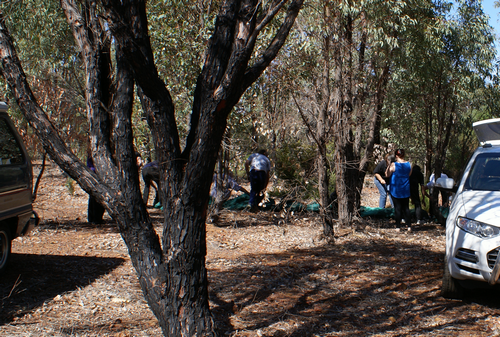 There are a number of these sanctuaries around the state who rescue and rehabilitate injured and orphaned wildlife. The purpose of this morning’s visit was to re-introduce some orphaned kangaroos into the wild by releasing them on our block! We already have a regular “mob” of kangaroos who break up into smaller groupings at various times of the year. 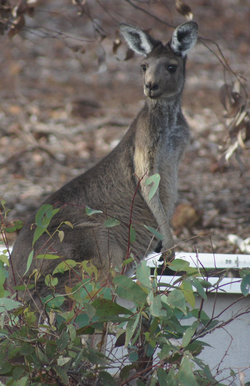 These ‘roos don’t live exclusively on our block but range across several adjacent properties – ours is just one that they visit. Kangaroos are frequent victims of traffic on our roads. 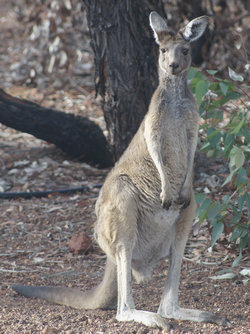 When females are killed or injured their young in the pouch (joeys) may well survive unhurt. However unless they are rescued they can’t live long once their mother is dead. Kangaroos are born very tiny and immature and once they reach the pouch they attach to a teat and remain out of sight in the pouch for several months. 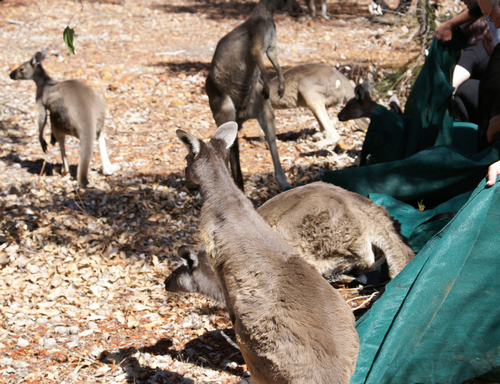 Rescued joeys are raised in artificial pouches – often woollen bags – and bottle fed with milk. Eventually they reach a size where they can live outside the pouch and feed on the normal types of food eaten by adult kangaroos. Before release the young kangroos of mixed ages get used to living together as a group in a large pre-release enclosure where they have far less human contact than during the raising phase. Finally a number will be released into the wild – this is what happened here today. 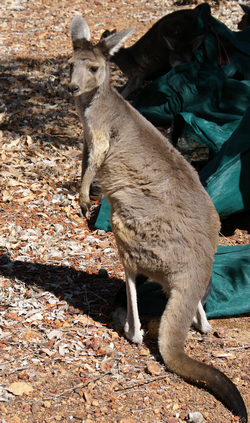 The team had successfully caught 15 young ‘roos from their large enclosure. They arrived in a convoy of cars in mid-morning. All very exciting as we hadn’t really expected quite so many ‘roos or quite so many people! The first step was unloading the young kangaroos from the cars. They had travelled in woven mesh bags and were very mildly sedated so they they wouldn’t panic either in transit or when released. The next step was to lay the travel bags out in a line, all “facing” in the same direction, and to unfasten them without actually releasing the occupants. A tricky activity this as there were more ‘roos than people. Once out of their travel bags most of the kangaroos stayed around for at least a few minutes getting used to their new surroundings. Then it was time to explore as they began to move away from the release spot. 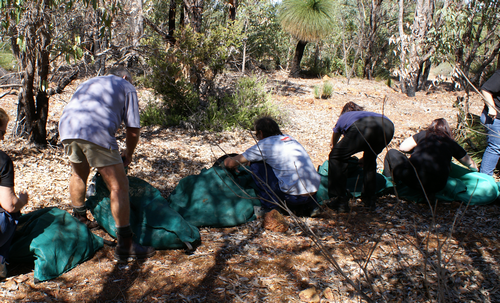 By the time the team had collected the bags unloaded some transition food for us to help tide the ‘roos over steadily to foraging completely for themselves most of them had moved away into the surrounding pockets of bush to investigate their new surroundings. We expect them to stay mostly hidden during the day and to come out to the release spot for water and some transitional food. We hope they will sort out a pecking order with our regular visiting mob and join in with them to form a larger mob where the new introductions integrate into the structure and eventually breed. 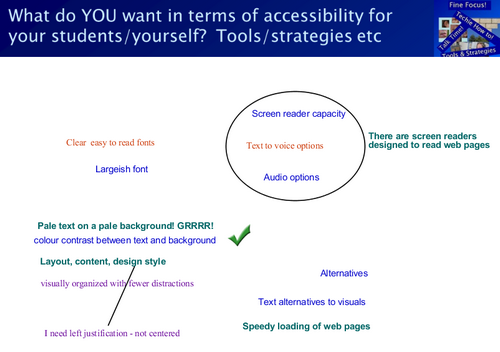 All in all an exciting and satisfying experience!